“A New Librarianship” Georgia Libraries Conference. Columbus, GA.
Abstract: Repeat after me: “Access does not equal impact or knowledge or improvement.”…unless you are also talking about access to education, economic opportunity, good schools, good nutrition, transportation, and resources. Yes, libraries are part of a whole network where we meet our communities’ needs, but we cannot simply assume all these needs are being met. We must be part of a proactive system that seeks to ensure them. We are not simply doing collection development with books and databases, but with schools, faith communities, philanthropies, social services, and the government. We must seek to connect the vast and diverse players toward equitable access across our communities. 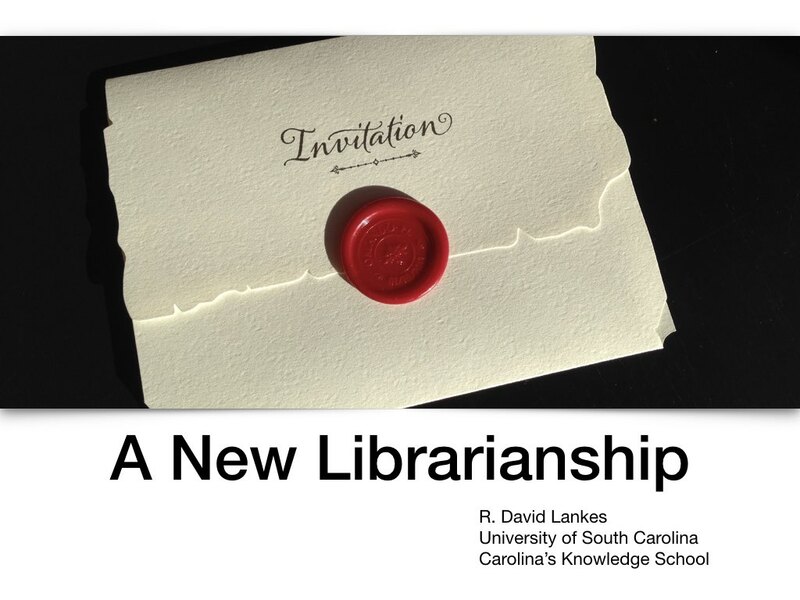 A New Librarianship from R. David Lankes on Vimeo. Our message as librarians must be absolutely clear – we exist to provide opportunities for all – opportunities that make us worthy of our shared existence .